After a quick breakfast in the very contemporary, beautifully styled Le Meridien in Thimphu, Chencho and Tashi met us in the lobby. We had been a bit sleepy during the drive to the city the day before, but we were wide awake and in awe of the scenery, the often single lane road, and Tashi’s skilful driving. But before we knew it, we were at the airport. I must say, that it was a true honor to spend time with both Chencho and Tashi. Each of them taught us much of the culture of Bhutan, just by being themselves. If you ever plan to go to Bhutan, let us know and we’ll send you all the particulars for the Travel Company, and be sure to ask for these two professional, knowledgeable and kind men. The flight out of Paro was a piece of cake for the pilot who flew in (you know who!) It was a beautiful flight, and it was great to be reunited with Travis. From the rural simplicity that is Bhutan to the oversized city of Bangkok we flew...and it took us by surprise. We landed to press, photographers, and a very gracious welcoming committee! 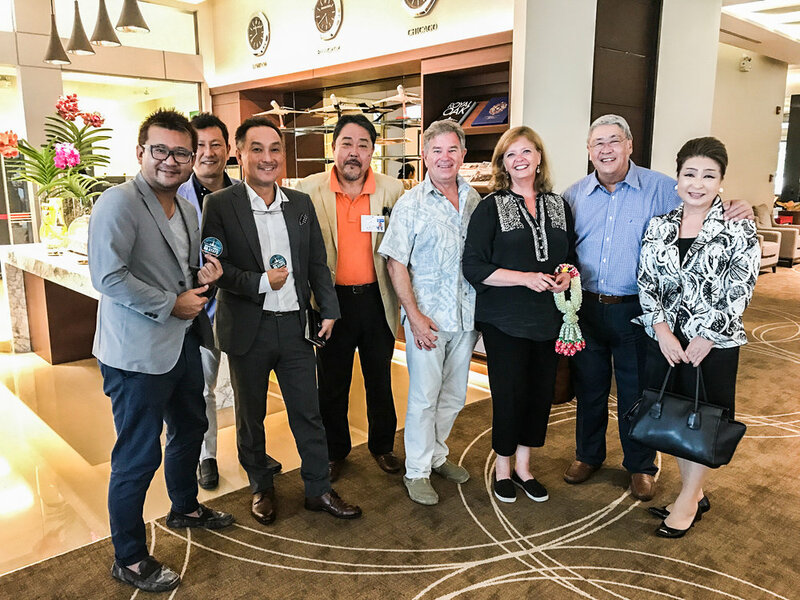 And we were ushered into the stylish and inviting FBO where we were presented with traditional Thai flower creations, by a beautiful former Miss Thailand! Good grief! We were overcome by the hospitality, and then settled in for two interviews with TNN (Thai National News) and another news outlet. HondaJet is big news in Thailand. It is recognized and appreciated for its unique design and its performance and comfort. We had the opportunity to visit with guests after the interviews and enjoyed meeting such a diverse and delightful group of people! HondaJet was well represented and we were so happy to be there! We were gently placed into a waiting car and experienced the traffic of Bangkok. Traffic in a city of over 8 million people is bound to get jammed up now and then! We settled into the quieter tower of the Shangri La hotel, and were relieved and happy to be in a cool, calm spot. We were just in time for a sumptuous spread of goodies in the lobby, a bit of a snack before bed. The welcoming flower creation in Bangkok. Such a welcoming group in Bangkok. Arriving at the Shangri La in Bangkok. Older PostFeeling On Top of the World...Literally!